Well, here it is...Kherington and Crew's little room. 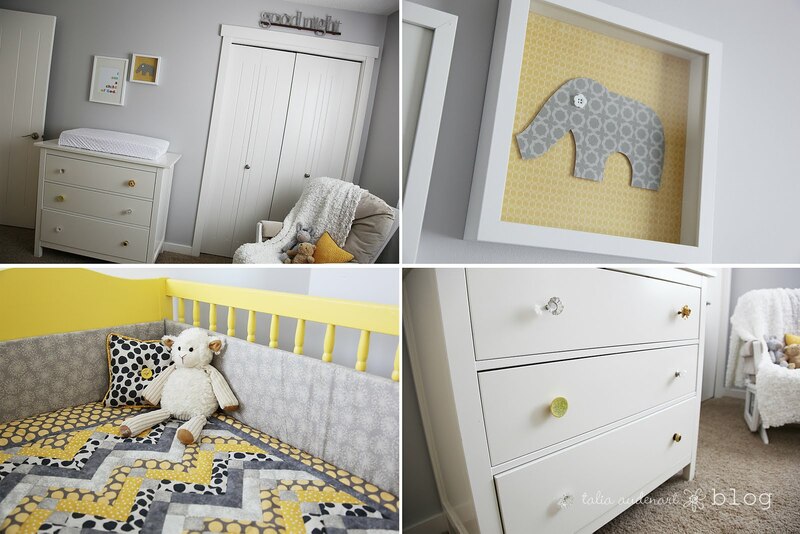 I had so much fun putting this room together and finished it and took these pictures last Tuesday morning...just in time, since I went into labour on Tuesday night! (nothin' like putting it off till the last minute!!) Anyways, for such a tiny room I had to keep it simple, but I think the fabrics and colors make it fun...I was totally inspired by all the grays and yellows I was seeing online, and thought that would be a fun color combo for a boy/girl room...take a look! This little Pooh bear was a gift from my dad and has been in all my babies rooms. KK's bed...she LOVES her bed! Naptimes and bedtimes are quite easy around here! All of the fabulous bedding was made by my mama. We went out shopping together and picked out fabrics, I told her what I kinda wanted, then she sewed everything up. I looooove how everything turned out!! 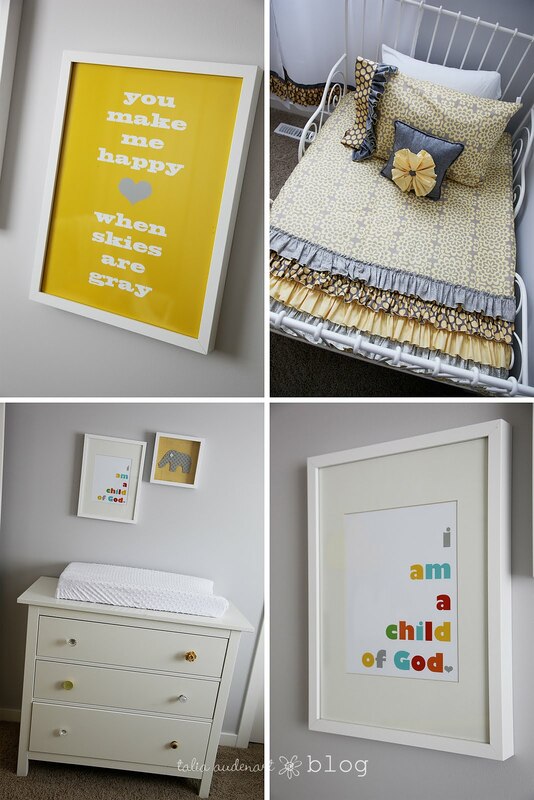 I'll be adding a picture of KK and Crew together above the change table, and I made the "I am a Child of God" print in Photoshop. Again, I'd seen alot of these online and just created my own. I made the little elephant shadowbox using scrapbook paper and this cute elephant template. Oh, and the fabulous knobs on the dresser are all from Anthropoligie. 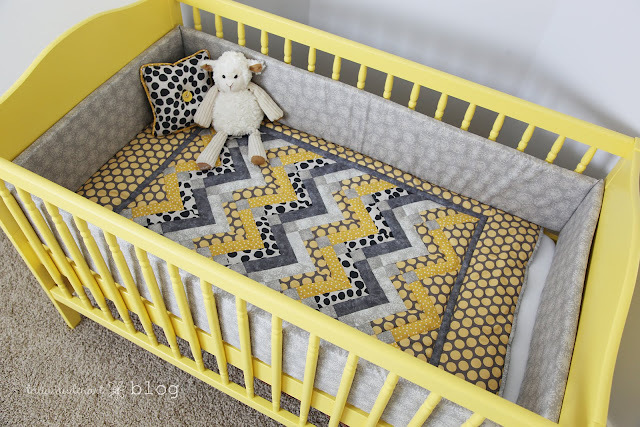 And, the yellow crib. I love it! (am I saying that alot?) 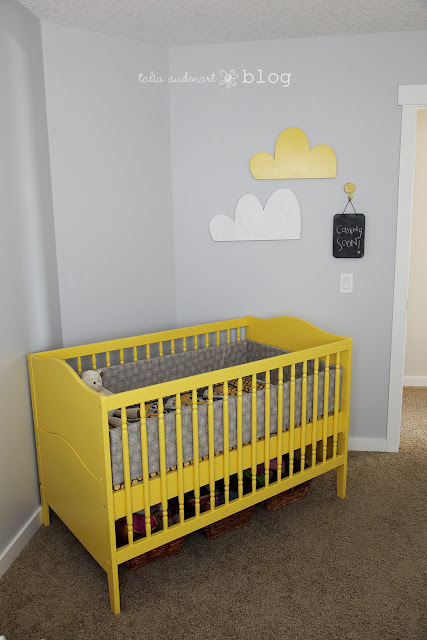 I wasn't sure if the yellow would be too much, but after having a pink crib for 2 years, what's the big deal to switch to bright yellow, right? These clouds were in KK's nursery, and I have a big "C" on order that will go above the crib, too. I haven't decided yet if I'm going to make/add a mobile for above the crib or not...we'll see! The gorgeous quilt and bumper pads made by my mom. Again, just loving the yellows and grays! And there ya have it! I'll still be adding a couple things here and there, but just getting the room this far before Crew was born was a huge accomplishment! It's tiny but functional for my 2 little babes...thanks for taking a peek! I just have to ask, where are you ordering your big "c"? I have been on the hunt for R and C. I haven't found anything I love. By the way, Congrats on your new baby. I have been a silent follower for some time now. I am always in shock at how much hair your babies have! One of my babies just turned 3 and she has less hair then your baby! Congrats, he is a cutie...and the name Crew...LOVE it! I love the "you make me happy when skies are gray" poster!!! Love it!! Especially love KK's bedding. Your mom did a fabulous job. 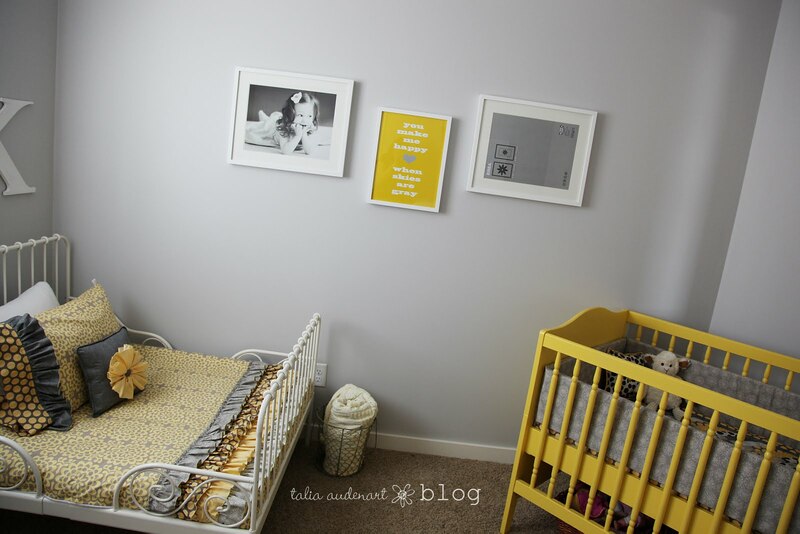 I think the grey and yellow were a perfect choice for this room! It turned out great, Tal! Love. and love your momma!! pass on luvs to those kiddies. Can't wait to meet Crew!! Love this room! I am amazed at how people can have such a vision of how a room should be and are able to put it together! amazing! oh my goodness...that room is simply stunning! love the color combo, and that bed is too sweet. Where oh where did you find that? Also, was curious if you could share where you do your fabric shopping? Those are such beautiful patterns. AMAZING job! You are amazing. PLease come to my house and tell me what to do with each room. Sheesh! Little Miss Talented! Love it! You pulled off the perfect room for a boy and girl. 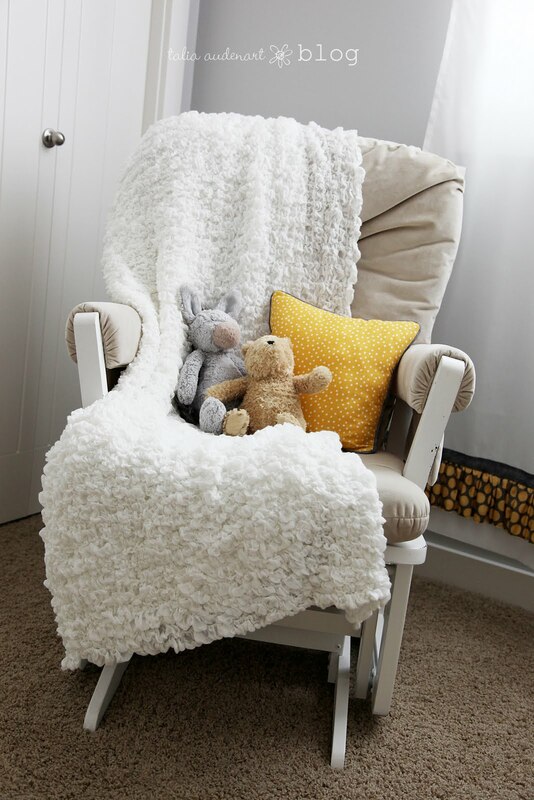 This room is beyond adorable! Just like its owners. I found your blog from your Big Picture scrapbooking class along time ago, and I just have to know what color grey you used! I want to do a grey room, but every color I pick looks too blue. What an adorable room! I absolutely love how this turned out. 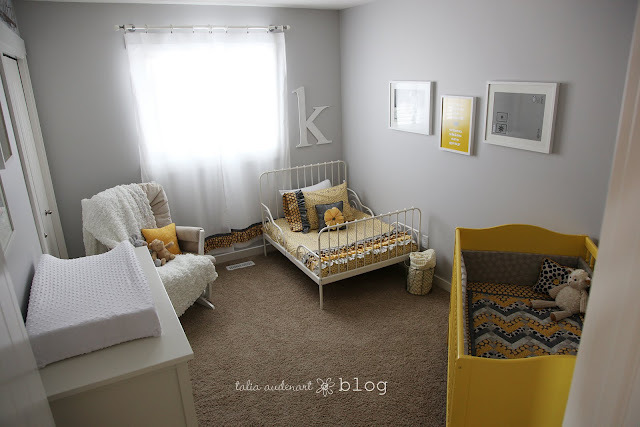 That yellow crib is awesome. Thanks for sharing and congrats! Oh my! I am in love with this room! Love the colours, love the ruffles, love the knobs! 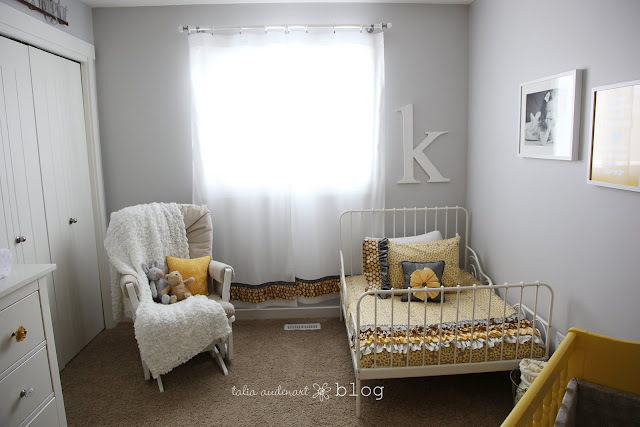 I have been following your blog for quite awhile now and just had to comment on the room...I LOVE IT!!! I am planning to do our master bedroom in grey and yellow and just wondered if you would mind sharing the paint color you used? It looks perfect! You and your mom are sooo talented! The room is amazing. Congrats on your little baby boy! I love everything about this room! You did such an amazing job. Yellow and grey is my favorite color combo and you pulled it off beautifully. Might I ask what paint color you used, it's lovely. Congrats on your son! I must know where your daughters bed came from! I loooove your daughters bed too! It's so adorable! Can you share where it's from? I have to know where you got that bed???? The room looks wonderful. Love it! I found your blog through pinterest... I've been on the hunt for a good grey FOREVER and I LOVE the one you choose for the room (which is beyond cute by the way). Do you mind sharing the name of the paint??? Thanks! This room looks so professional! I'd love to talk to you about featuring it at Baby Lifestyles. Please email me at editor at BabyLifestyles dot com if you're interested to discuss further. Amazing job! Talia, I know several people have asked already, but I would love to know where you got your k from. My son's name will also start with a k and I love the one in your nursery. I have looked at craftcuts-Times New Roman, but yours seems to have a bit of a different look. the k was given to me by a friend 2 and a half years ago...she had it cut by someone she knows, so it's not something that can be ordered or bought! so sorry!! i just painted it myself. and i think some people had askied about the fabrics used in the room...my mom and i just went to a few local fabric stores and mixed and matched fabrics that we thought were cute. i don't know specifically what companies they were made by! Thanks so much for the reply. I think my husband is gonna be able to cut out a similar font using Apple LiSung Light. Love what you did with the shared room. Oh my gosh this room is so simple but yet so amazingly beautiful! I love the toddler bedding! It is absolutely adorable. 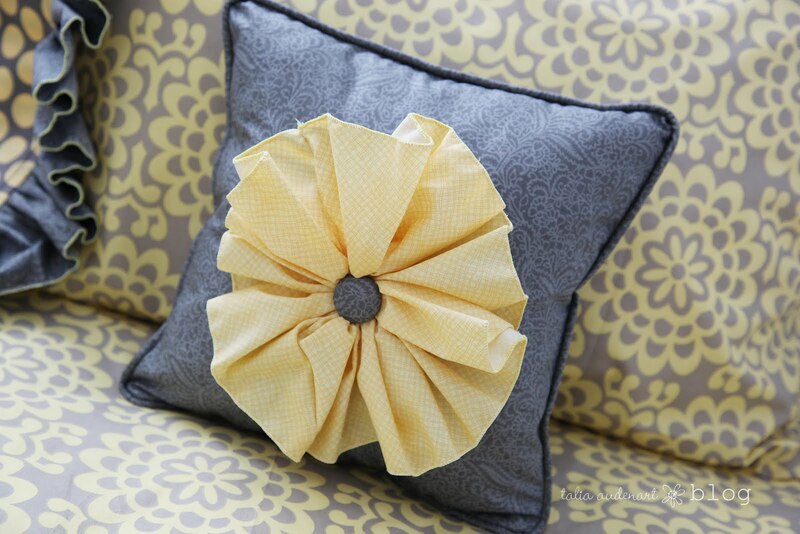 The ruffles & pillows are so awesome... I want them in my room! You are an amazing decorator! i love love this! can you tell me what the ruffle piece on the bed is actually? a sheet? a duvet? so cute. So so adorable! I just love it. How much fabric did you end up buying for the bed sheet/duvet and ruffles? I'm just transferring my baby to a toddler bed and this would be so cute on her bed. Also with the bumper pads what pattern did she use or site for the tutorial I love how its all one solid piece. I love it all! Would also love to know what paint color you used(gray?)!?! 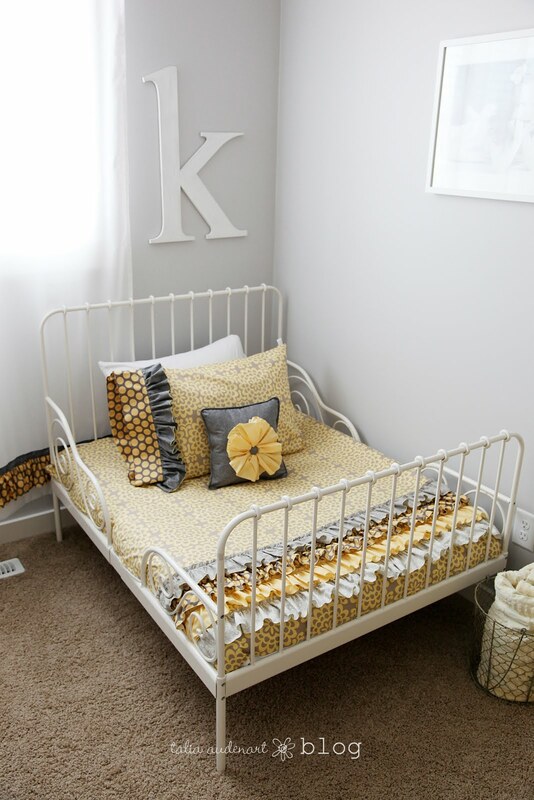 Where did you find the rod iron toddler bed? I would love to get one for my daughter. I'm not usually a fan of yellow, but I LOVE, LOVE, LOVE this room... it's so perfectly sweet! I have to ask - where did you find that large monogram? I'm on the hunt for one for my son Connor's room. o my. i am so in love with this room...and your blog! your kids are DARLING!! im so glad i found your page, new follower..!!! I love the room!! Would you and your mom mind sharing how you made the ruffles? 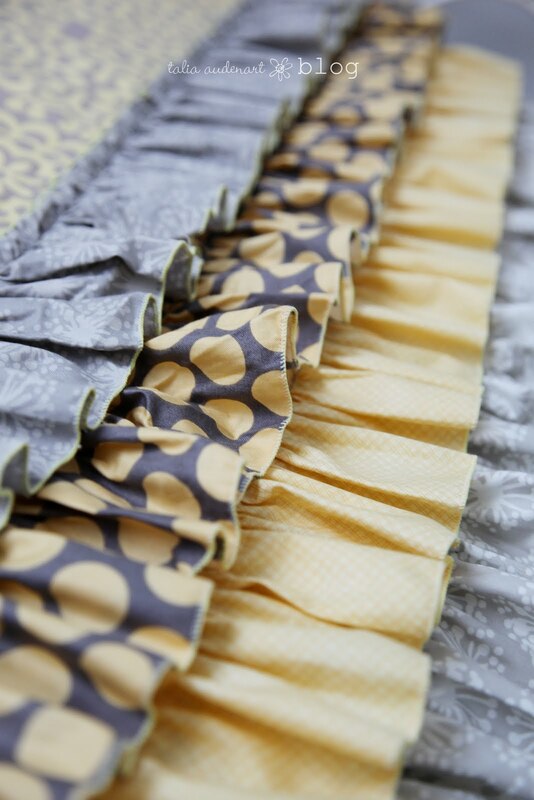 I would like to make a ruffle bedskirt similar to the ruffles you made. Beautiful!